The Swedish banking system was heavily regulated by a comprehensive set of controls of domestic and cross-border flows of credit until 1985. The Riksbank held the total volume of credit roughly at a constant level in relationship to GDP (Figure 1). This was a period of considerable financial stability with fairly small movements in real stock prices and house prices. Following the financial crisis of 1992-93, the Swedish economy started on a long recovery. Since the mid-1990s, total credit to GDP has been on an upward trend, almost doubling from 1995 to 2008 (see Figure 1). Household debt to household income has steadily risen for more than 20 years, from 90% in 1995 to 179% in 2015. The Riksbank (2016) estimates this ratio will reach 193% by 2018. The Swedish level has far surpassed the peak of 2008 in the US and has now reached the same level of the UK in 2008 (see Figure 2). Source: Andersson and Jonung (2015). The rapid growth in credit is accompanied by a sharp rise in asset prices. Real house prices have grown annually by 4.9% and real stock prices by 6.7%, while economic growth has been 2.5% between 1995 and 2015. 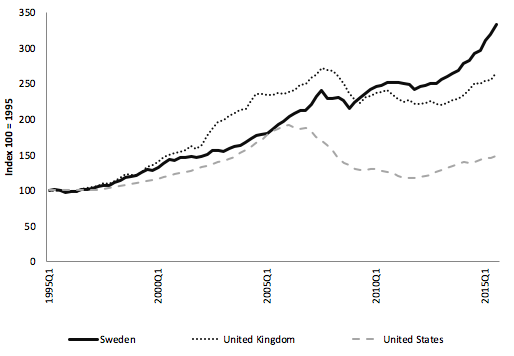 The growth in real house prices in Sweden for 1995–2014 surpasses that of the US and the UK by a wide margin (see Figure 3). Contrary to Sweden, these two countries experienced deep financial crises in 2008 which arrested the upturn in house prices. Although Sweden avoided a crisis in 2008, house prices declined slightly in 2008–09, before reverting into a new rise that has tended to accelerate in recent years. The close association between rising house prices and a rising volume of credit raises the question of causality. Our econometric tests suggest that the expansion of credit has contributed to higher real house prices.3 The effect is most clearly discernible in the Stockholm region. There is also a feedback from rising house prices, increasing demand for credit. Other factors have impacted on house prices as well, such as restrictions on the supply of housing, rent controls, mortgage interest deductibility, population growth, and a strong rise in household income. But all in all, credit expansion is an important driver behind house price inflation. The unprecedented growth of credit during the past 20 years is closely associated with an expansionary monetary policy. The Riksbank has reduced its repo-rate from 9% in 1995 to -0.5% in 2015 (see Figure 4). The expansionary stance is fuelled by Riksbank purchases of government bonds. By now, approximately 30% of all SEK denominated government bonds are held by the Riksbank. This level exceeds the purchasing program pursued by the ECB (Riksbank, 2016). The effect of the falling policy rate on real house prices is illustrated by Figure 4. 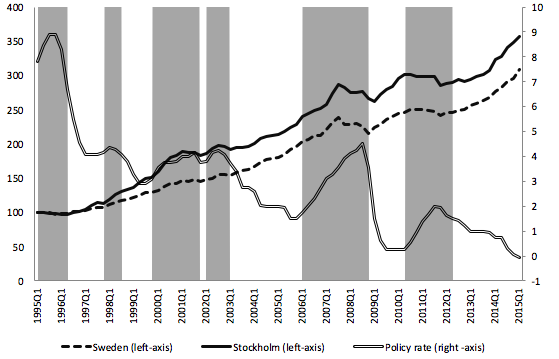 It displays real house prices in Sweden as a whole (black dotted line) and in Stockholm (black solid line) – where prices have increased the most – as well as the policy rate of the Riksbank. The blank areas in Figure 4 correspond to periods when the Riksbank lowered the policy rate compared to the previous year, and the shaded areas correspond to periods when the Riksbank increased the policy rate compared to the previous year. A clear pattern emerges—the growth in house prices stabilises or falls approximately six months after the Riksbank starts to increase the policy rate. House prices begin to rise six months after the Riksbank starts to lower the policy rate. The expansionary Riksbank policy is explained by its adherence to the inflation target of 2%. Low inflation has caused the Riksbank to lower its policy rate despite the stimulating effects on debt and house prices. Since the early 2000s, members of the Riksbank board have been concerned by a possible conflict between financial stability and price stability. In the past five years, tension has been running high within the board.4 One group has promoted leaning against the wind while another group has argued for the sole focus on the 2% target. Recently, the majority has explicitly moved to the position that the inflation target should be the one and only goal of the Riksbank. This simple calculation suggests a reduction by 50 percentage points, corresponding to six months’ disposable income for the average household, in order to get back to a sustainable path. For households with large loans taken in recent years, the adjustment would be much bigger. A decline by 50 percentage points exceeds the reduction in the interest ratio during the Swedish financial crisis in the early 1990s as well as the correction in the US and the UK after the 2008 financial crisis. We do not see that such a correction can take place through higher economic growth. 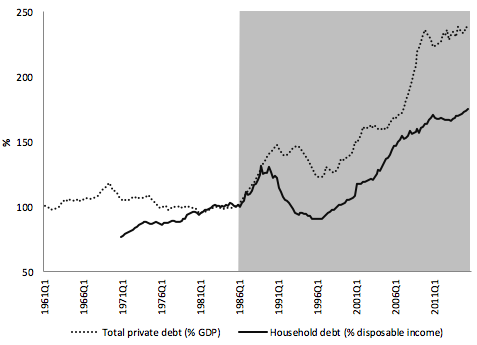 Growth has been high in Sweden in recent years while the household debt ratio has been rising—not falling. Rather, the most likely adjustment will take place through higher real interest rates, most probably through rising international rates being transmitted into Sweden. Rising interest rates will induce households to amortise more on their loans to reduce the burden of debt. The risk with such a process is that it can turn into a bust with falling consumption, rising savings and rising unemployment. Falling house prices will foster a downward cumulative spiral, well-known from the history of financial crises. There is a growing awareness about the risks stemming from two decades of consistently growing debt ratios and house prices. But this awareness has not yet been transformed into decisive policy action. New measures concerning amortisation rules, soon to be enacted to reduce household indebtedness, may actually contribute to the crash they are intended to prevent. Of course, we cannot rule out the possibility that the Swedish authorities may find a way to arrest the house price boom without bringing about a bust and a financial crisis. If they do, this time will be different. Andersson, F NG and L Jonung (2015) “Krasch, boom, krasch? Den svenska kreditcykeln” (“Crash, boom, crash? The Swedish credit cycle”), Ekonomisk Debatt, 43(8): 17-31. Goodfriend, M and M King (2016) Review of the Riksbank’s monetary policy 2010-2015, 2015/16:RFR7. Jonung, L, J Kiander and P Vartia (eds) (2009), The Great Financial Crisis in Finland and Sweden: The Nordic experience of financial liberalization, Edward Elgar, Cheltenham. Reinhart, C M and K S Rogoff (2009) This time is different: Eight centuries of financial folly, Princeton University Press. We allude here to the title of the monumental study of financial crises by Reinhart and Rogoff (2009). Finland, Norway, and Sweden went through roughly the same boom-bust cycle in the early 1990s. See Jonung et al (2009). See Andersson and Jonung (2015). Goodfriend and King (2016) have recently documented the lively clashes within the board. For the historical pattern, see for example Reinhart and Rogoff (2009). See Andersson and Jonung (2015) for the details of these calculations.